Maria Loizidou was a young graduate of the Lyon School of Fine Arts and still based in Paris, when she caught the attention of the special Committee assigned by the Ministry to propose artists for the biennial. 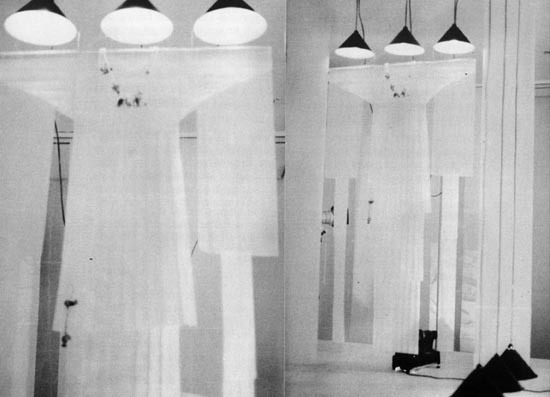 Loizidou’s work, borrowing themes from Greek Mythology, was a minimal installation, atmospherically lit, making use of ephemeral materials like rice paper, as well as video projections and sound effects. The Arsenale space, with its heavy industrial architecture and high ceilings, was very difficult to work with from a technical point of view. The budget was nominal and the Cypriot mission (artist and curator) had to rely on the random support of the biennale crew responsible for setting up the official sections in the Giardini and Arsenale. This made the process extremely painstaking and stressful, but the result was up to standard and Loizidou’s work, in tune with the main shows emphasizing new media technologies, was well received. The installation has been faithfully reproduced for the purposes of this exhibition, based on the artist’s original designs. 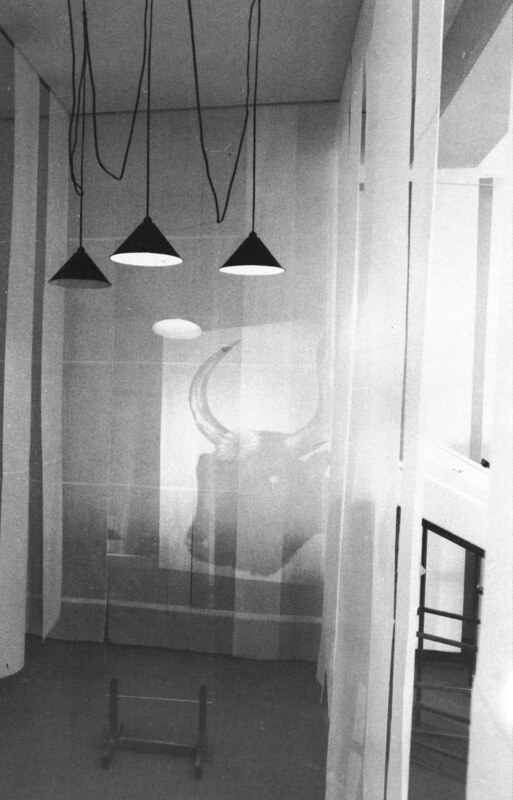 Μαρία Λοίζου, Installation Views, 1986. Maria Loizou, The Myth of Ariadne, 1986. Maria Loizidou is a visual artist, educated in Lyon, France and settled in Nicosia, Cyprus. She has taken part in exhibitions (Documenta 14, 2017, Venice Biennale of Art, Cyprus National participation, Arsenale 1986 and Architecture, Cyprus and Greek National group participation, 2016, 2006, 2004). She created public projects (Kerameikos, Athens, Fatima, Portugal, Futuroscope, Poitier) and gave lectures in various institutions. Relevant collaborations with museums (MAMC, Musée d’art moderne et contemporain, Saint Etienne, Musée des Beaux Arts de Lyon, Benaki Museum, Athens,EMST, National Museum of Contemporary Art, Athens, Sungkok Museum, Seoul, Bozar: Palais des Beaux-Arts, Brussels) keep renewing her work’ s perspective enriching it with social and political concerns giving emphasis to “the power of fragility”. Her collaboration with AA & U For Architecture, Art and Urbanism has given her the possibility to address such issues on an interdisciplinary level. Loizidou represented Cyprus at the 42nd Venice Biennale of Art. Born in Nicosia. She studied Social Sciences at the University of Geneva. He is a Ph.D. of the University of Athens in the history of Art. She worked at the Center for Social Research (1971-1977) and in the Cultural Services of the Ministry of Education and Culture (1977-2009), which she served as director from 2003 to 2009. She was for many years the representative of the Ministry of Education and Culture in the Committee on Culture the Council of Europe and various committees of the European Union. He was also Secretary General of the Cyprus National Committee of UNESCO from 2001 to 2009. He is the author of many studies, works of art criticisms and books on modern art. Her book “Christoforos Savvas, the beginning of a new era in Cypriot art”, was honored with the 2009 State Prize of Literature in the essay-research class. He was honored by the French government with the Order of the Knight of the Order of the Academic Phoenix and by the Austrian government with the Honorable Cross for Arts and Sciences. She is a member of the International Association of Art Critics (AICA) and the Society of Historic Art of Greece. Since 2012 she has been working with the Leventis Art Gallery as a curator of the Cypriot collection of the LA Leventis Foundation.